I was wondering if there was any sugar because of Midori's sweetness but since you use half midori / half gin, I guess it is normal to have some. I'll try your version for sure. Thank you ! Dry shake, shake, strain, up. Tried this out. Tastes like a Creamsicle crossed with a watermelon Jolly Rancher! OK. Had to give this a try. I used some homemade melon liqueur I made last summer. Basically vodka infused with Saticoy melon. The melon was super sweet so I didn't sweeten it further and the product is amazingly aromatic, as was my drink. Tart and refreshing. 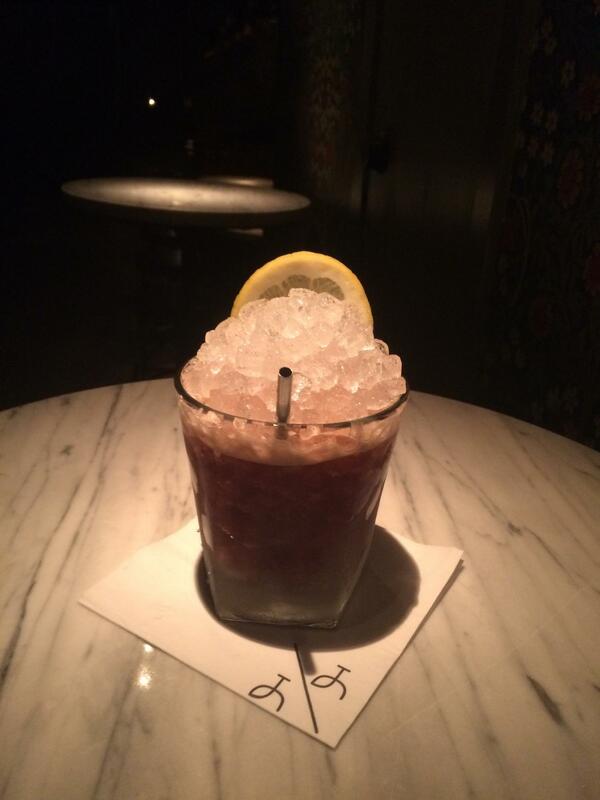 Last night's other quaff, The Up & Up's very own By The Fireside, one of my favorites from our menu. Tawny Port, chicory coffee, lemon juice, cinnamon, and nutmeg. 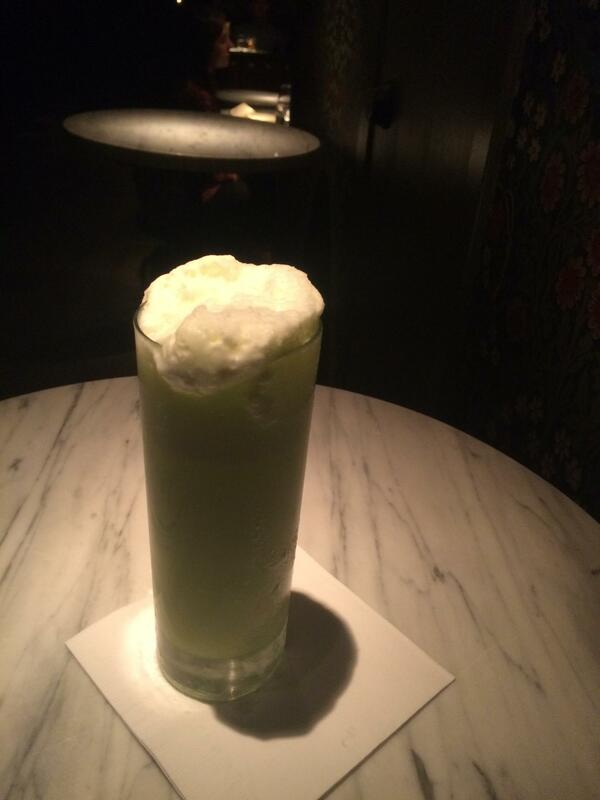 Following a most decent if not all that memorable late work night dinner -- a liaison with my girlfriend the green fairy. But at least after interminable days of snow and rain and mud I had enjoyed fresh mint with my mai tai. Went to The Dispensary here in Bendigo for an ok aviation. I would have cut way back on the Violette and bumped the lemon. Didn't recognise the Violette brand and forget what the bartender said, but she did say they could get a bottle for me. I told her that I might as well have them keep making the drinks, given how long it would take me to go through a bottle. 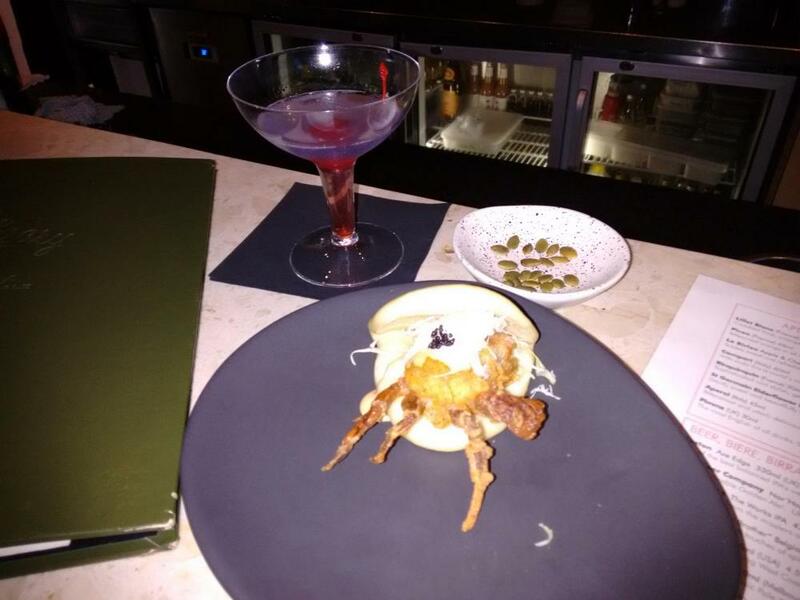 The steamed soft shell crab buns more than made up form my fussiness regarding the drink. A fabulous Vieux Carré (Walter Bergeron) with Willet 5-year rye whiskey, Pierre Ferrand 1840 cognac, Martini Gran Lusso vermouth, Benedictine, Angostura & Peychaud's bitters. There are hints of spring everywhere and I had to have a Ti Punch. La Favorite rhum agricole blanc, JM sugar cane syrup. Tried a concoction called Fall to Pieces I found here because I like simple 1:1;1:1 style cocktails. When they work. This one seemed a bit too boozy, which is saying something for me. Maybe a bit less rye and brandy? Scorpion via Serious Eats via Jeff Berry via whoever. 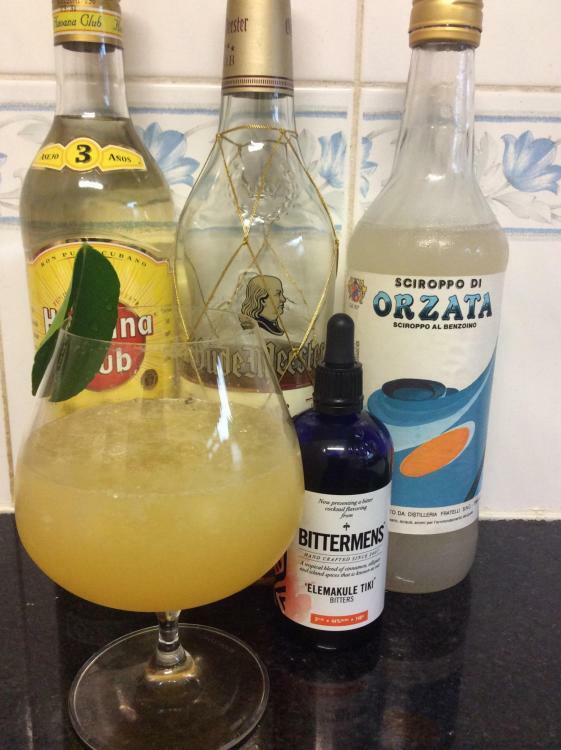 I used the bitters as a garnish. From last night - I was in the mood for a Gibson. I didn't have any pickled onions so I used pickled fennel made with a recipe in Mario Batali's Babbo. Gibson variation (2:1) with Tanqueray London dry gin, Noilly Prat extra dry vermouth, pickled fennel. Following dinner I wanted something, but not something older than I am nor that cost more than my net worth. I am enjoying a glass of Gosling's Old. In lieu of a photograph, it's dark amber and it looks very much like rum. Oops, now I must go take the wine out of the freezer. Enjoying a pre-dinner Uffizi: Bonal, Cocchi Americano, and grapefruit juice, with a salted rim. Subbed red juice for white because that's what I had; subbed smoked salt for salt because I recently got it and wanted to try it out. This was tasty and light, a real winner (and no doubt will be even better if I undo my silly substitutions next time). My drink-mixing life is accompanied by low-level but constant fretting about using up my perishable wines before they go bad. So this is additionally a double winner for helping me work down two fridge bottles, deliciously. "This very unusual cocktail is dedicated to the spot made famous by the charge of the Light Brigade which was a spectacular, tragic, and rather unnecessary military gesture." That way I didn't have to wash the wine glass. It's kummel, grenadine, and cognac. Why I don't make this more often I do not know. Location:North Yorkshire, sometimes La Flèche. Supermarkets here have been engaged in a price war in respect of champagne for some months now, some of the offers are really nice wines so we have taken advantage. This has brought us to testing the French 75 which we both really enjoy. This and other recent cocktails have been based on details from Robert Hess of Small Screen Network. His short films are a great source for beginner cocktail mixers. 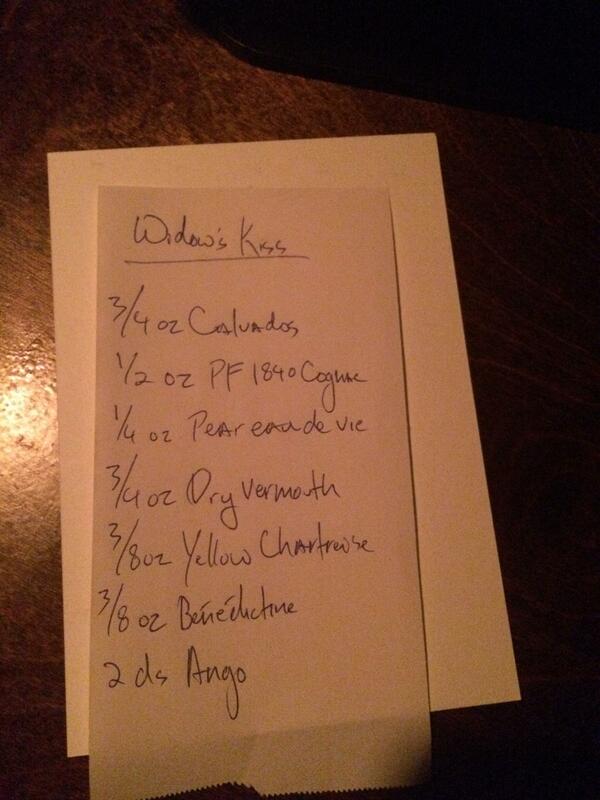 @DianaB you can use Methode Rotuts to make your French 75. I have used it for mine. I had a lovely cocktsil last night in a bar called El Duderino in Jönköping, Sweden. 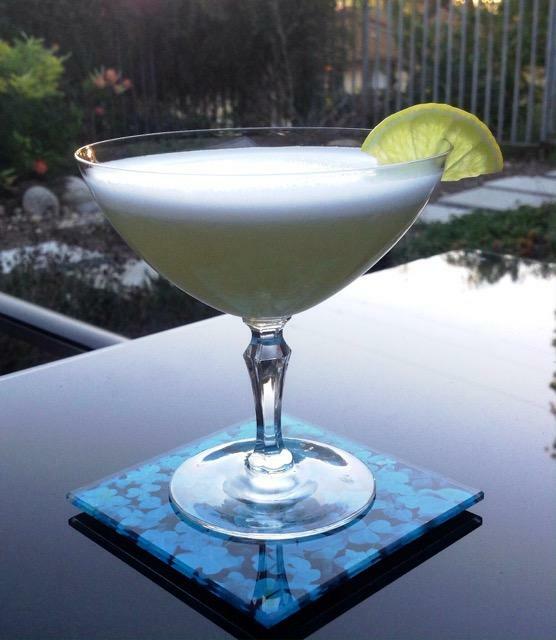 It was called La Verde and was comprised of mescal, lime, agave and chartreuse ( yellow VEP), chartreuse elixir and egg white with a line of Bunnahabhain Toiteach floated on top. It didn't last long enough to take a picture. It was Incredibly herbal and smokey. I can't wait to try it at home. @Craig E, if you liked the Uffizi, you might like the Italian Greyhound: equal parts grapefruit juice and Punt e Mes, shaken and served on the rocks with a half salt rim. Thanks for this, I recall reading the thread a while ago and getting as far as looking at the various devices that can be used to transform wine in this way. We are lucky in being able to get Champagne at trade price from one of the smaller growers, the only problem being that we need to predict how much we will need for a year. Out of interest, what does a bottle cost in the various parts of the world where readers from this thread buy Champagne? I guess it will be more expensive out of Europe? If you can get a bottle of Champagne in New Zealand for under NZD50 you're doing well (or it's been dumped, or something). The comonn ones (eg Moet) generally start around $60 or 70, and of course the sky's the limit. I make a French 75 variation (called the Wellington 75, and why not?) with a local product called Joiy. It's a slightly sweet, slightly lemony, slightly fizzy, low-alcohol riesling-based product that its maker (full disclosure: friend of mine) is endeavouring to get into various overseas markets. I think it's available in some outlets in Australia, possibly Hong Kong and Singapore and he's working on the US. 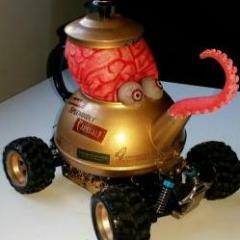 If you see it somewhere, give it a try. It's nice on its own as a summer drink, and the Wellington 75 recipe can be had for a modest fee. Goes right down, but very tasty. Heads up, though, @EvergreenDan: the Iggy calls for Punt e Mes, not CAF. Fun fact: when I worked at a rooftop bar this past summer, the Italian Greyhound was one of our most pooular drinks, even among the decidedly non-cocktailian set of rooftop-seekers we hosted. I believe the only drinks that outsold it were the Margarita and the mighty Tito's-soda. I am working, at work, on a series of revised or reconsidered classics for our bottled cocktail program. For the most part I like to stay true to the spirit of the original, augmented by as much research as I can muster (my Presidente contains many of the additives common to Cuban rum of that period); but where history and my palate part ways, I commit cheerful sacrilege (my Presidente has apricot eau de vie, because it's delicious). A bonus pleasure involved in batching drinks for bottling is that pre-service assemblage allows, or in my case encourages, involved and finicky recipes, such that I can split my base spirit among three brandies (as in the attached recipe) rather than be at the mercy of the Calvados blender (as in my simpler à-la-minute Widow's Kiss recipe). Anyway, I've included a photograph of my spec, rather than of the finished product, so you can all join @Hassouni in critiquing my handwriting. Also, you should all visit The Up & Up when you're in toen. We have fun here.